You Can Now Get C_NCENTRATE Delivered On Messenger Or Slack! Simply click the button below to get C_NCENTRATE delivered to your Messenger window or Slack app. You can still sign up to get the email version here - we're just trying it out! HERE/FORTH CEO and @themediaisdying Founder, Paul Armstrong, was asked by Digiday for his thoughts on The News Hub - an emerging startup that wants to pay writers for good content in similar fashion to BubbleWS and TSU. ‘The problem that many platforms of this ilk suffer from is a lack of focus and planning with regards to the network effect required for immediate and continued success,’ he said. 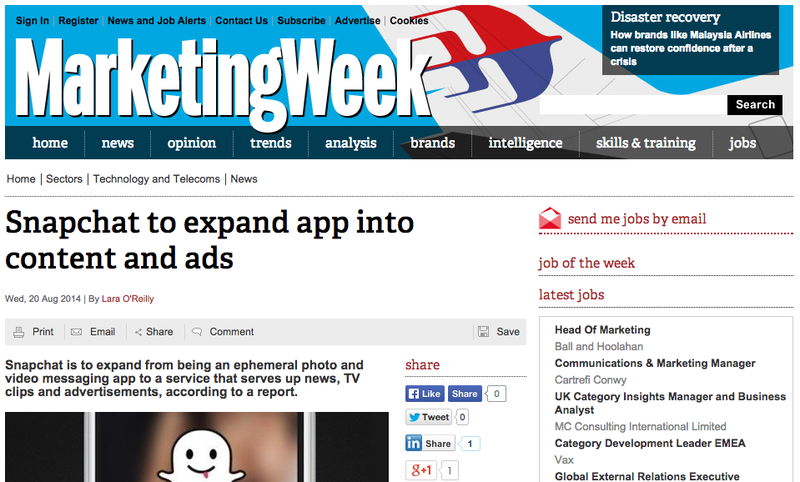 Is Snapchat about to launch news and ads? It certainly seems like it. HERE/FORTH Founder, Paul Armstrong was asked about what this means for the service and why they are moving in this direction by MarketingWeek.